Based on the animated movie by the same name, Ice Age 2: The Meltdown brings you the adventures of Scrat, the saber-toothed squirrel. As the ice is slowly melting, the creatures of Ice Age are enjoying themselves on slides and in pools from melted ice in the valley's Water Park, unaware that the glacier which surrounds the valley is gradually breaking apart. Because of a silly stunt by Sid the sloth, Manny the wooly mammoth and Diego the saber-toothed cat discover that the glacier functions as a dam, holding back a sea of water which would flood the entire valley and kill all animals trapped in it. They warn all animals but can't convince them of the imminent danger. Luckily a vulture, who looks forward to feast on the countless carcasses, does convince them, and even tells them of a large tree at the other end of the valley which could function as a boat and save them all. All creatures head for the boat, hoping to get there before the valley floods. On their way, Manny, Sid and Diego meet some new companions: possums Crash and Eddy and their 'sister' Ellie, who is a mammoth but thinks she's a possum also. During their adventures, Diego is confronted with his fear for water, Sid nearly gets sacrificed to the Fire God in a sloth village and two sea reptiles, Cretaceous and Maelstrom, are hunting them down. This third-person action adventure game places you in the role of Scrat, the pathetic saber-toothed squirrel, while you follow the adventures of the movie protagonists on their path to safety. Scrat travels through various worlds, collecting as many nuts as possible to unlock bonus features in the process. He'll start his journey in Water Park, and travel through the forest and Sloth Village and also through new locations like the Mud Bog and even inside the bowels of Maelstrom to finally arrive at the Glacier. Scrat can jump, climb, slide, use trampolines, swing ropes, sniff, dig and many more things - he can even ride swamp birds and use his tail as a torch! In addition he has a range of combat moves at his disposal, like stomp, roll and spin attacks and the ability to throw pebbles against the many angry creatures he encounters, from rock-tossing beetles to piranhas, birds, and polar bears. The game also features several mini-games, introducing a nice variety in addition to the main game play: ride the Eviscerator as Sid, try catching Crash and Eddy as Diego, play penguin bowling, throw pebbles at forest monkeys and more. The game, developed by Eurocom (which also designed Robots, features voice talents of the original move cast, like Ray Romano, John Leguizamo, Denis Leary and Chris Wedge. It was also Fox Interactive's last title. 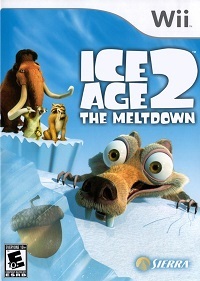 Ice Age 2 was released for the IBM PC, GameCube, XBOX, PlayStation 2 and, later on, also the Wii. Alternate versions were also developed for the GBA and Nintendo DS.